Searching for a tulip that is as elegant as it is colorful? Introducing Orange Ballade, a lovely lily-flowering variety that is at once slender and strong with a wonderful color palette. Each stylish bloom bears graceful petals of luminous orange that change to a richer shade toward the edges, and features a sunny golden-yellow shade at the base. 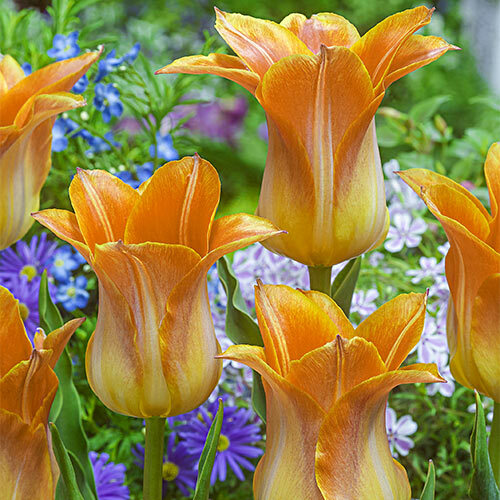 It is a warm and welcoming tulip that makes a striking display in a border or cutting garden. Plant them in groups for an even more spectacular showing in late spring. Orange Ballade is easy to grow and tolerant to a range of well-drained soil types.